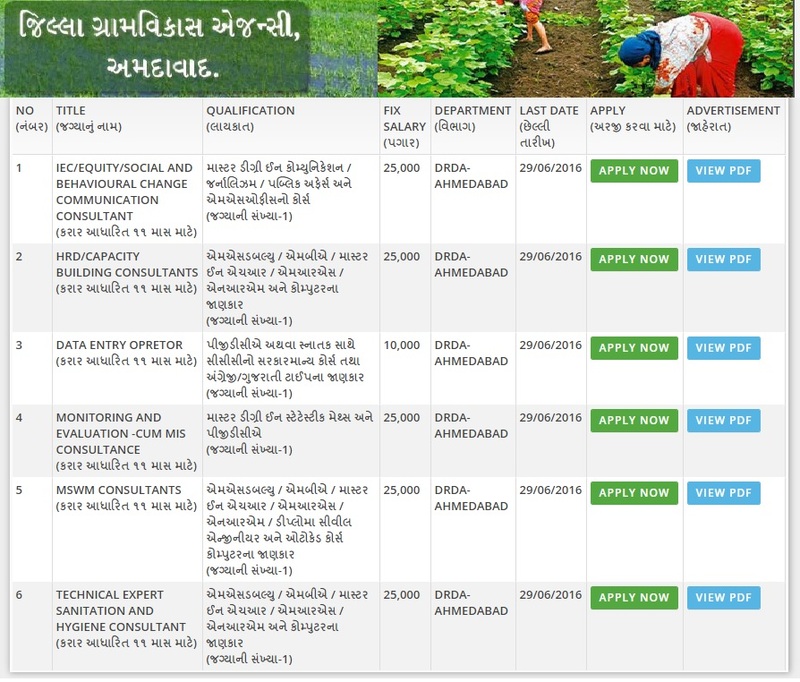 District Rural Development Agency (DRDA), Ahmedabad has published a Advertisement for below mentioned Posts 2016. Other details like age limit, educational qualification, selection process, application fee and how to apply are given below. Qualification : Master Degree in Communication / Journalism / Public Affairs & M.S. Office Course. Qualification : M.S.W. / M.B.A. / Master in HR / MRS / NRM & Having Computer knowledge. Qualification : Master Degree in Statistics / Maths & PGDCA . Qualification : M.S.W. / M.B.A. / Master in HR / MRS / NRM / Diploma in Civil & Having Computer knowledge. Qualification : PGDCA OR Any Graduate with Computer knowledge CCC with Gujarati / English Typing & Data Entry with good speed knowledge required. Application Fee: Rs. 150/- for General & OBC candidates (Rs. 50/- for SC / ST) through Account Payee Demand Draft (DD) drawn on any scheduled Bank in favour of Director District Rural Development Agency Ahmedabad.